The quick wit and eccentric caricature of the actors in The Musical Comedy Murders of 1940 carry the show smoothly through its nearly two-hour run time. 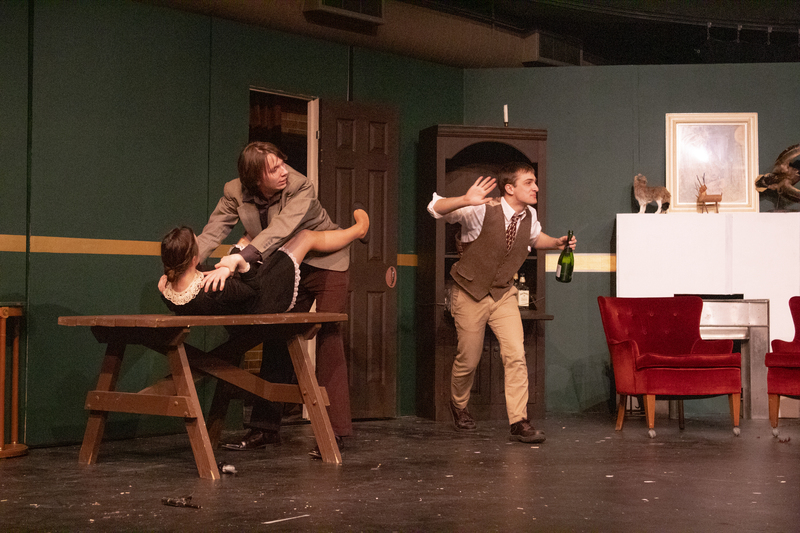 The play, opening at Edinboro University's Diebold Performing Arts Center on Valentine's Day, is entirely student-run and "not your typical murder mystery," Director Torie Witherow said. "It takes your typical tropes and turns them on their heads." Originally written and directed by John Bishop, the play gained critical attention and acclaim after it premiered in New York City in the late '80s, later becoming a Broadway success under its original director and cast. Though previewed on the first day of tech week while set changes were still being made, the cast has already boldly stepped into their roles, confident in both persona and lines. The arrangement of said cast is almost as unique as the twists and turns Bishop took with the script. 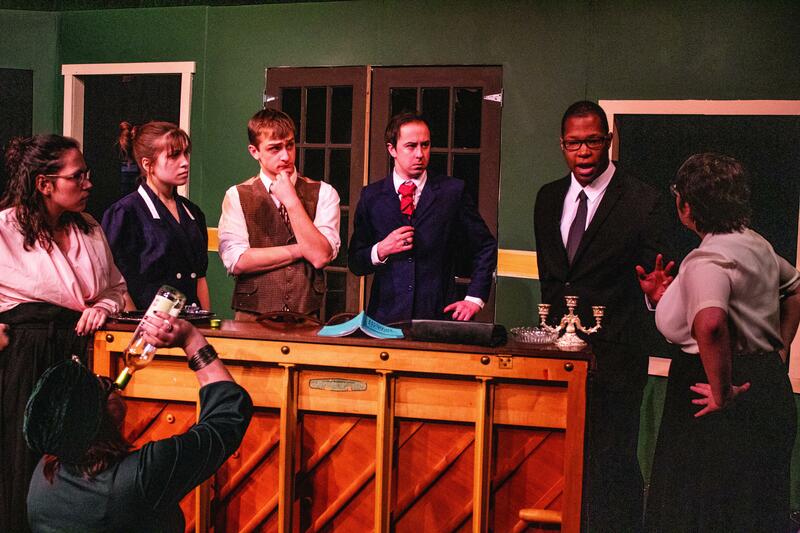 In The Musical Comedy Murders of 1940, there are no leads. Each actor and their corresponding character play a critical role in the story. No one role is more influential or important to the play than another, Witherow explained. This said, the collegiate cast has talent that stands out, even in such a strong group. Elsa Von Grossenknueten, the wealthy theater-lover who brings the characters together to her upstate mansion for a backers audition, is played by Elise Cohen, whose voice projects clear as glass in the black box theater. Mason Kuhr, playing the role of Eddie the comedian, keeps all eyes on him with his theatrical and genuinely funny facial expressions and body language. Rich Kolbosky impersonates the arrogance necessary for Ken, a successful theater (and recently cinema) director. And Helsa, Elise's German housemaid, has an accent that never breaks or falters thanks to Livia Homerski. The remainder of the 11-person cast is filled by Abby Ricci as Nicki, Lamont Jones as police officer Michael Kelly, Hope Errera as Bernice, Sydney Dobbs as Ruth, Gwen Bogaczyk as Marjorie and Mikhail Firree as O'Reilly who has the ability to make the audience just the slightest bit uncomfortable with his awkward advances on Helsa. "I've done comedies hundreds of times...and seen this show countless times, and I'm still laughing," Witherow said. The show is "as historically accurate as we can afford," assured the director, referencing the period respective costumes and set pieces. In addition to the antique props and dress, the sets itself uses details — such as secret passageways — to bring the show to life. 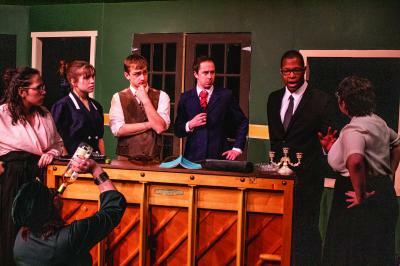 Though Edinboro University no longer hosts any academic minors or majors in theater, "I want to show the community that we're still here...and willing to put on a great show for them," Witherow said. If you're wondering if you should brave the weather to watch comedy theater about theater in a snowstorm, take advice from the ever-energetic Eddie: "Sure! That's one of my rules; Always say, 'yes!'"